Cooking all three meals 7 days a week in the Marshall Islands is already challenging so we have not done a Sunday Challenge since we moved here. But finally I have become accustomed to the normal challenges associated with the lack of ingredients here that it was time for a different kind of challenge. So this week's Sunday Challenge was to "make a full course meal only with finger food". Come to think of it, we regularly eat finger food. Pizza, chicken wings, sushi, yakitori, sandwiches... so it is not an unusually difficult to whip up something. But to make it more interesting, I decided to stay away from those regular finger food items. 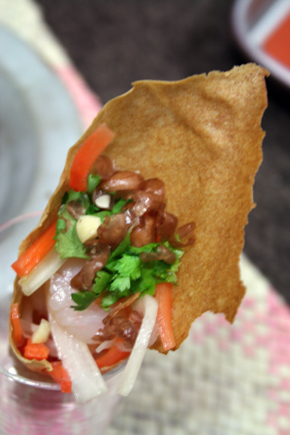 For the salad course, I used Chinese spring roll wrappers to make cones. 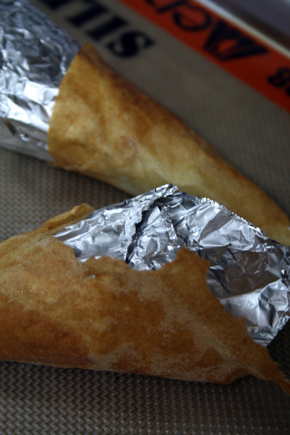 Shape aluminum foil into a cone and gently wrap the spring roll wrapper around it. Bake in a 350F oven until golden brown. Then julienne daikon, carrots, celery and boiled shrimp dressed with Vietnamese style dressing (fish sauce, rice vinegar, sugar and oil). Sprinkle some cilantro leaves and fried garlic chips and peanuts on the top. 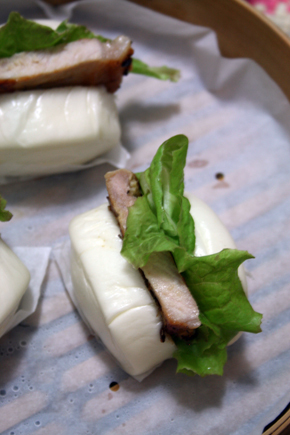 I like pork buns. I usually make the bun myself but I did not have time to start from scratch so I purchased frozen buns from a Chinese grocery store. 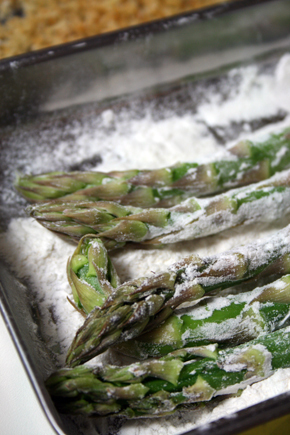 I think these will be one of my staple freezer items for an impromptu party. The pork was actually nothing special. And it is not even Chinese style pork. I used regular boneless pork chops and marinaded them with some garlic, salt and olive oil for 10 minutes and pan fried just like a regular pork chop. I was going to make a white wine sauce (my favorite sauce for pork chops) but I changed my mind at the last minute and made a mustard sauce. This one was the least successful item. I was envisioning a fried skewered but oven-fried style did not create enough crunchiness to it. 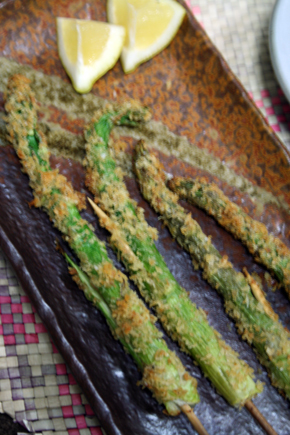 And the asparagus was slightly overcooked. This one turned out to be very good and super cute! 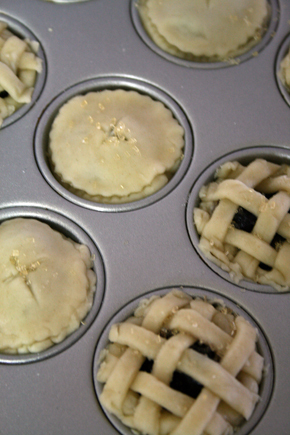 Make regular pie dough and cut out the rolled dough into a circle to cover the bottom and side of a mini-muffin tin. Then put a small amount of macerated blueberry with sugar and vanilla and cover with another piece of pie dough. 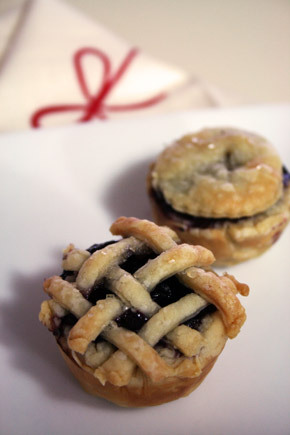 The mini-lattice top pie was really cute. Caution: it is hard to stop popping these small pies into your mouth.